During last year’s Republican presidential primary campaign the RNC called me once or twice a week begging for money. I refused, based upon the fact that my candidate of choice, Donald Trump, was given no respect by the Republican Party. That is about the same time the “Washington establishment” emerged from the shadows into the light of day, and shockingly, half of the Trump-hating establishment was and is Republican. It wasn’t only Clintons, Obamas, Pelosis, and Schumers. There was a boatload of Republicans in that swamp too. Then, when Trump secured the nomination, the calls from the RNC increased in frequency and intensity, the telemarketer on the other end of the phone always pleading that WE have to donate to the RNC to get Donald Trump elected. I still refused, citing the abhorrent treatment of President Trump by Rinos like Paul Ryan, John McCain, Lindsey Graham, et al. Instead, I sent every dime I could afford directly to the Trump for President campaign on a regular basis, once a month by automatic debit from my bank account, and even more here and there as I could afford it. The Democrat Party is committing political suicide. It is already dead, it just doesn’t know it yet. The Republican Party (or at least many establishment members of the GOP) is not much better off. President Trump has done a phenomenal job thus far implementing his agenda, which is the agenda of We the People, notwithstanding the efforts on both sides of the aisle to obstruct the president’s progress every step of the way, especially in the Senate, where the Republican majority, which should be putting President Trump’s agenda into law, is nullified by a handful of Rino senators, keeping key legislation, like the full repeal of Obamacare, from happening. Now those chickens are coming home to roost. We reported last month that Siphilus is more popular in Arizona than Jeff the Flake, who is polling at 18% favorable in his home state. 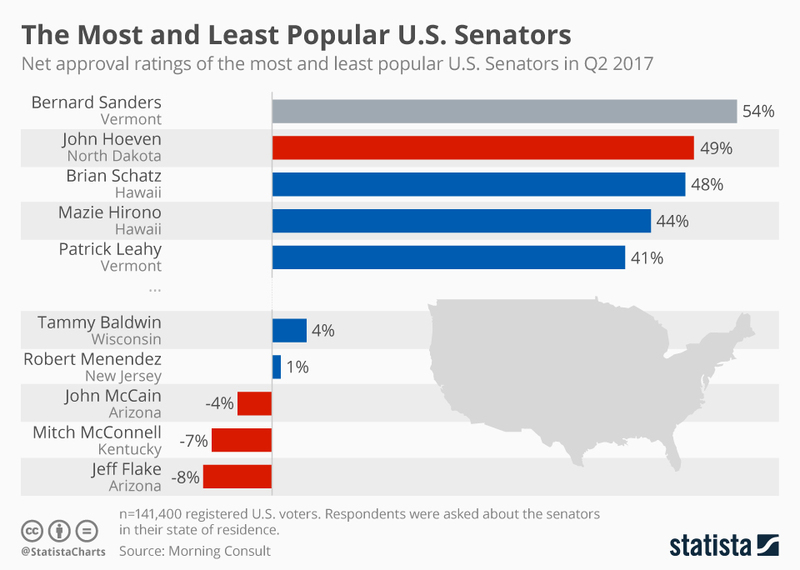 Geezerly contrarian and career traitor Songbird McCain, Arizona’s other Rino contribution to the Senate, shares the basement in the popularity department with a pair of fellow Rinos, McConnell being sandwiched between McCain and Flake, pardon the image.There is a price to pay for being a duplicitous scumbag! (see chart, below). 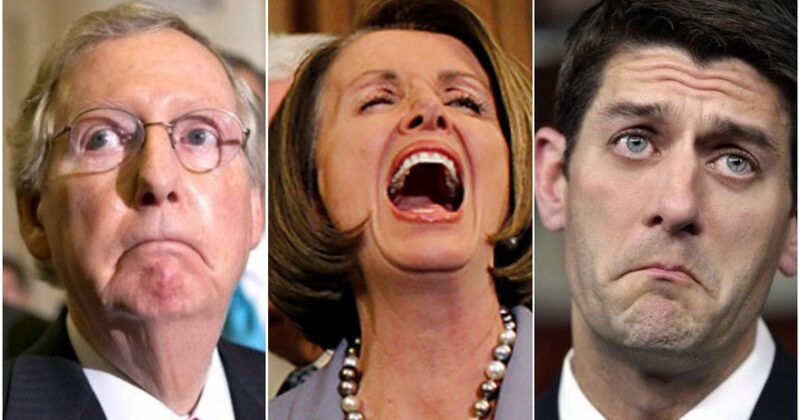 You can now add Paul Rino’s name to the list of congressional Republicans less popular than a sexually transmitted disease. One need not be a political scientist to understand these dismal numbers for Ryan and McConnell. Both have been exposed as massive liars and frauds, both have serially-betrayed their base, both are terrible leaders who are unable to use a historic, once-in-a-generation opportunity to get a single thing done. Ryan did manage to get Obamacare passed through the House, but it was an objectively awful bill that failed to keep the seven-year promise of full repeal. McConnell failed to pass even a bare bones Obamacare repeal. On the other important issues of the day: immigration, taxes, the border wall, defunding Planned Parenthood, spending restraint, killing the senate filibuster before the Democrats do, it has all so far been one cowardly whiff after another. What is so galling about all of this is that a frustrated Republican base knows exactly what is going on here. Republicans now control every branch of the federal government. This means that everything they have promised us they would do, they can now do. But either out of cowardice (fear of the media) or their true ideological love for bigger government and open borders, they simply refuse to. So it was all a big fat lie… All those promises, seven years of them from the GOP about all the awesome things they would do, all the massive changes they would make … if only we voters would trust them with full control of the government. Well, we fulfilled our end of the bargain. Republicans are now in a position to pass whatever they would like. But who knew that in reality we were calling their bluff? Who knew that all these promises were nothing more than lies designed to improve fundraising, to expand mailing lists? Who knew the GOP had absolutely no intention of doing a damn thing, and that includes protecting and defending their own president — you know, the guy who on a daily basis takes flaming arrows in the back for the sin of actually wanting to keep his promises? We have been hustled, hoodwinked, lied to, and taken completely for granted.